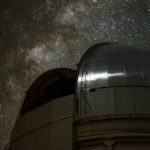 Scientists working on the Dark Energy Survey (DES), an international project mapping a few hundred million distant galaxies to learn more about dark energy, discovered the most distant supernova ever detected. Designated DES16C2nm, the supernova took place 10.5 billion years ago when a massive star exploded at the end of its life. It is classed as a superluminous supernova (SLSN), the brightest and most rare of all supernovae. 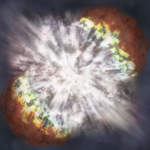 “Such supernovae were not thought of when we started DES over a decade ago,” explained Bob Nichol, Director of the Institute of Cosmology and Gravitation at the University of Portsmouth in the UK. Mathew Smith of the University of Southampton, also in the UK, and lead author of a paper on the findings published in the Astrophysical Journal, noted the rare finding gives astronomers better understanding of the rare superluminous supernovae. The colossal cosmic blast happened only 3.3billion years after the Big Bang, when the universe was a quarter of its current age, and light from the supernova has taken 10.5billion years to reach Earth – the Universe itself is thought to be 13.8billion years old. The supernova, named DES16C2nm, was identified by a team led by Southampton University for the Dark Energy Survey (DES) – an international collaboration mapping far-off galaxies. The team confirmed it is a superluminous supernova (SLSN) which is the brightest and rarest class and up to 100 times brighter than other types of stellar blasts. 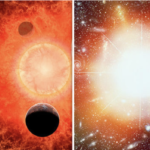 Lead author Dr Mathew Smith said: “DES16C2nm is extremely distant, extremely bright and extremely rare – not the sort of thing you stumble across every day as an astronomer. “It’s thrilling to be part of the survey that has discovered the oldest known supernova. An international team of astronomers has discovered the oldest supernova ever detected — a huge cosmic explosion that took place 10.5 billion years ago. 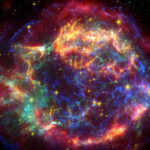 A supernova is the explosion of a massive star at the end of its life cycle. The exploding star, named DES16C2nm, was detected by the Dark Energy Survey (DES), an international collaboration to map several hundred million galaxies in order to find out more about dark energy — the mysterious force believed to be causing the accelerated expansion of the universe. 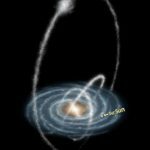 As detailed in a new study published in The Astrophysical Journal, light from the event has taken 10.5 billion years to reach Earth, making it the oldest supernova ever discovered and studied. The research was led by Mathew Smith of the University of Southampton in collaboration with Chris D’Andrea, a postdoctoral fellow at Penn, and Masao Sako, an associate professor in Penn’s School of Arts and Sciences. Researchers at the University of Portsmouth also contributed to the research. STUDENTS from Seaford Head School attended a Stargazing Live! Event organised by the widening participation team at Sussex University. 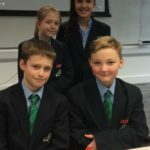 Pupils from Year 7 spent the day at the Falmer campus and enjoyed a tour by one of the university ambassadors and were able to ask questions about what life at university is like. The day also involved a number of stargazing workshops using spectroscopes to identify different gases; group work on dark matter presented by the Dark Energy Survey; a lesson on exoplanets and how to spot them; and an amazing show in the planetarium. 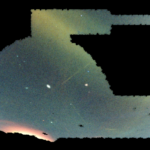 The Dark Energy Survey (DES), a project designed to explain cosmic expansion, has released its first three years of data. So far, the project has mapped 5,000 square degrees or about one-eighth of the sky. DES is an international collaboration between over 400 researchers, including scientists from the University of Chicago Physical Sciences Division, Fermilab, and Argonne Laboratories. They have compiled a repository with nearly 400 million distinct catalogued objects detected from imaging. Stellar streams are very difficult to detect because they are composed of stars spread out over large distances. Nora Shipp, a graduate student in the Department of Astronomy and Astrophysics, is leading the DES identification of new stellar streams, which affirms the DECam’s power. “These discoveries are possible because DES is the widest, deepest and best-calibrated survey out there,” Shipp said. Free, detailed information on 400 million astronomical objects, anybody? Just visit the website of the Dark Energy Survey (DES) – it’s there for the taking. 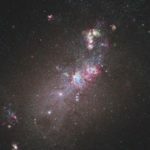 At a special session of the 231st meeting of the American Astronomical Society in Washington, D.C., scientists presented the first data release (DR1) of the survey, containing observations that were collected between mid-2013 and early 2016. Among the preliminary results: eleven new stellar streams in the Milky Way galaxy and new constraints on cosmological parameters. 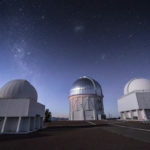 The Dark Energy Survey is carried out with the giant Dark Energy Camera (DECam) at the 4-meter Blanco Telescope of the Cerro Tololo Inter-American Observatory (CTIO) in Chile. Built at Fermilab in Chicago, DECam sports 62 sensitive CCDs with a grand total of 570 million pixels. The 4-ton camera has a huge 3-square-degree field of view. The survey’s main goal is to solve the riddle of dark energy – the mystery force behind the accelerating expansion of the universe. The first intriguing findings have been released from the Dark Energy Survey, a project that’s studying the sky to find clues about the mysterious force that seems to be accelerating the expansion of the universe. And among the data is the discovery of 11 new stellar streams, the remains of smaller galaxies that our own Milky Way has torn to shreds. Scientists examining an exhaustive survey of roughly 400 million objects in the cosmos have discovered incredible new insight on the violent ‘eating’ habits of the Milky Way. Preliminary results from the Dark Energy survey have revealed a stunning look at the remains of 11 smaller galaxies that have been devoured by our own, reducing them to stellar streams. As these objects are typically very difficult to spot, scientists say the most recent find could pave the way for other important discoveries about our universe – such as narrowing down the properties of dark matter. It’s well known in astronomy that – when we look up at night – all the stars we see belong to our Milky Way galaxy. But astronomers are coming to understand that not all Milky Way stars were born here. Instead, some stars appear to have migrated to our galaxy from other galaxies. The evidence comes from streams of stars detected in our night sky, thought to be created when small galaxies interact with our Milky Way. 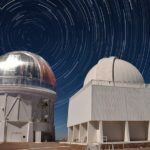 At last week’s meeting of the American Astronomical Society in Washington D.C., astronomers announced the discovery of 11 new stellar streams, discovered in data from the ongoing Dark Energy Survey (DES).